On learning the theme of ‘Monochromatic’, straight away I knew I was going to use my stash of indigo dyed fabrics, including wool, fine linen, scrim, ribbon, because I could produce a meaningful sample and still have plenty of pieces left for the final quilt, something that I am not able to do very often. However, it is something I intend to pursue, as well as using my sketchbook, in future, especially in light of some of my friends in our 15 x 15 group showing their lovely sketches and saying how useful they are in helping to produce work. 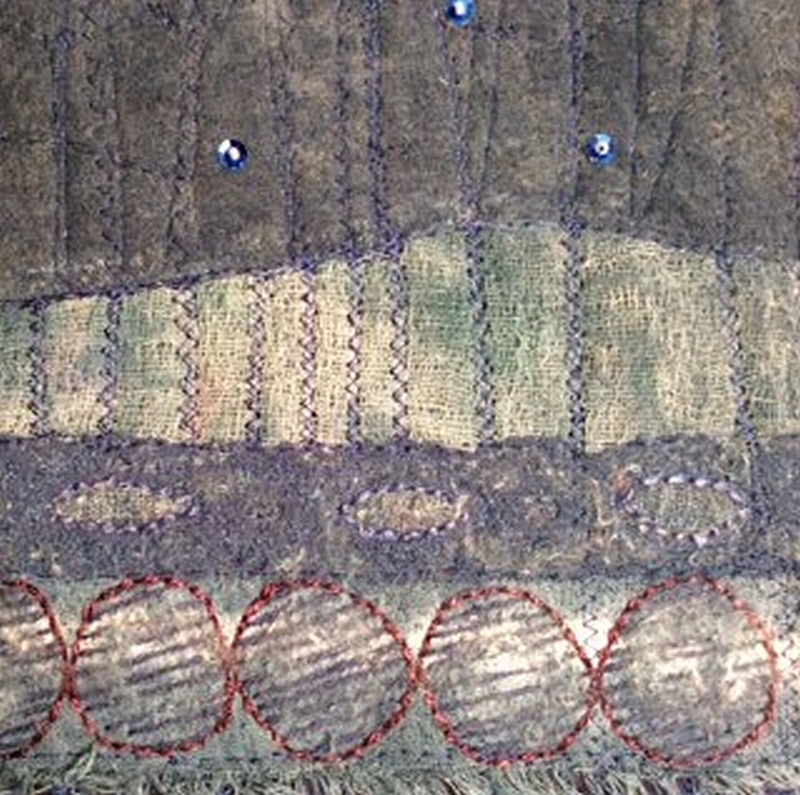 On a base of wool, I attached, via an embellisher machine, scrims, muslins, lightweight cottons and ribbons cut into the shapes on my drawing, which represented a very bleak, wintry scene. Prior to quilting by hand and machine, I put a fine cotton backing on and then quilted as usual. I so enjoyed stitching this soft fabric made up of wool and scrims, the scrims giving me the type of ‘rural’ look that I was looking for. I would certainly use this method of construction again, but feel that this particular quilt is perhaps a little darker than I wanted. With this in mind, I brightened the night sky with blue sequins. I’m interested in your initial attachment of the components by embellisher rather than layered with fusible web. (I own an embellisher and am embarrassed not to have done more with it). The touch of red is an interesting highlight, too. I like it! I like the atmosphere in your quilt, dark but beautiful ! 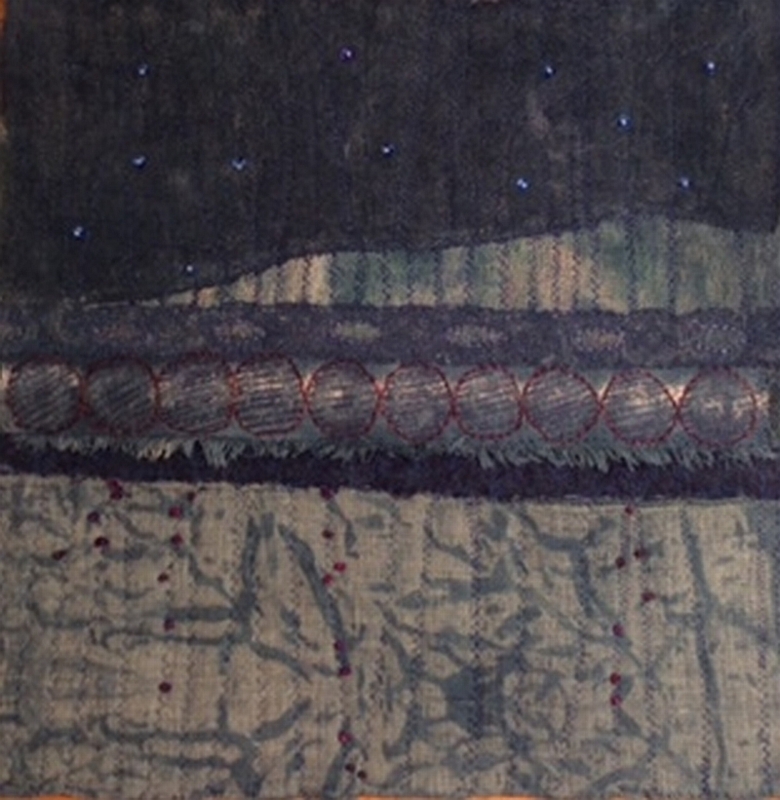 Margaret, I used the embellisher to merge the different shades of indigo fabrics I had, including an indigo dyed blanket, used as wadding, as for some reason I felt that it would unite the varied shades of cloth and thread that I had. I loved hand stitching on it and the ‘red’ thread which appears on the photo is actually a very deep blue. Obviously, the camera felt red looked better. Thanks for your comments. Thank you Chantel for your comment. Thank you Margaret, I too have not used my embellisher a lot, but I really enjoyed using it on this piece, as I felt it enabled the merging of the shades better than any other method. The ‘red’ thread is actually a very dark blue, but obviously the camera preferred to show it as red. I have posted a comment before, so forgive me if you have a duplicate. Can’t imagine where it went. Great to see a completely different approach, an embellisher is on my wish list, you have used it very effectively. Think that this piece would really benefit from being seen in the flesh to see the details and merging fabrics with more clarity. I hope to see this quilt in real. I think it is even nicer then. You make me want to use my embellisher also.